This latest release from the multi-award-winning partnership of Gerald Finley and Julius Drake features a literary and musical form which inspired the greatest voices of German Romanticism. The foremost poets and composers of the age saw the ballad as a direct link to the folk-minstrels of the past. Frequently ghoulish and sensational in character, ballads satisfied the popular taste for the Gothic. This disc contains some of the greatest examples of the form, including Schubert’s Erlkönig, as well as some fascinating and lesser-known works. 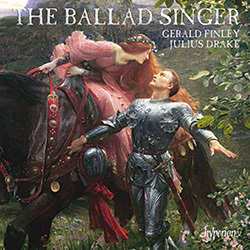 The disc also includes selections from the ever-popular English ballad tradition. Gerald Finley’s unrivalled gift for characterization and story-telling, honed both on the stages of opera houses around the world and through his extraordinary Lieder recordings, makes him the ideal performer of these works. This is a genuinely entertaining and original disc. Performances full of raging fortissimos and ghoulish tremolandos from Finley and his pianist Julius Drake. Drake knows how to be pianistically comedic as well as dramatic, romantic as well as impish. His artistic contribution is a significant reason for this disc’s success.